Feb. 28, 2007 -- On Thursday, March 8, at 5 p.m., the Bradbury Gallery at Arkansas State University will hold an opening reception for “New and Used,” an exhibition featuring artworks inspired by common objects. The work of four artists, John Adelman, Virginia Fleck, Ian Lemmonds, and Paul Villinski, will explore how the ordinary can be a stimulus for the creative mind. The exhibition includes drawings, photographs, assemblage, and sculpture. John Adelman of Houston, Texas, creates highly conceptualized outline drawings of various found objects. Adelman states, “I seek the two-dimensional representation of a three-dimensional entity.” Almost anything from spare car parts to a bowl of cereal can inspire him, as well, as he dissects objects into their component parts and then translates these three-dimensional entities into two dimensions. He never seems to make a mark without having justified its purpose. 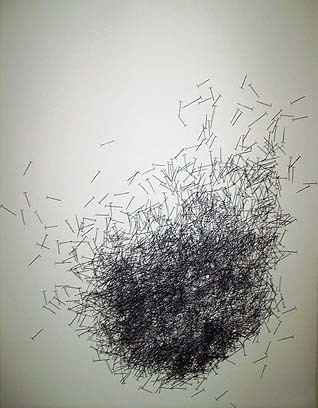 The artist describes his process for “Lot (nails)”, 2007, gel ink on paper—thus: “”Lot (nails) is the full amount of the one-inch and two-inch nails contained within the artist’s studio, precipitously dumped directly on the surface and traced wherein they lay. Each nail was traced once and placed back into the container.” Adelman meticulously traced and thus recorded 8, 084 nails. Adelman received a B.F.A. in Drawing, Painting, and Printmaking from Ohio State University in 1992. In 2006, he received a M.F.A. in Drawing and Painting from the University of North Texas. He has been included in several group and solo exhibitions such as “Drawings” at Holly Johnson Gallery, Dallas; “635331” at Stafford Gallery in Denton, Texas; “Works on Paper” at Mills Pond House Gallery in St. James, New York; “Draw/Drawing 2”, London Biennial, The Foundry, London, England; “New Directions 2005” at the Barrett Art Center in Poughkeepsie, New York and “Amarillo Biennial: 600 Drawing” at the Amarillo Museum of Art in Amarillo, Texas. Adelman’s work is available through Holly Johnson Gallery, Dallas, Texas (www.hollyjohnsongallery.com). F leck’s beautiful works are created from thousands of colorful plastic carrying bags from retail stores. She cuts and pieces her monumental works, assembling what she calls mandalas—large circular assemblages that, like their Buddhist and Hindu counterparts, refer to various tangible objects and circular geometric patterns which metaphysically and symbolically represent the cosmos. Her mandalas, like those in Tibetan sand paintings, depict a microcosm of the universe from a human perspective. Fleck describes her work thus: “Like a bad dream, the thousands of bags in my studio develop a collective voice. They are hawking the “American Dream,” promising success through consumerism. It strikes me that this “Dream” has dreamed me. I cut the bags into pieces. Without premeditation, I assemble medallions, checkers, and zigzags, letting my hand choose.” By letting her hand or her unconscious choose, Fleck echoes Carl Jung’s view of the mandala as “a representation of the unconscious self. Born in New York City, Virginia Fleck now lives and works in Austin, Texas. She received formal training at the Maine College of Art from 1978-80 and the School of the Museum of Fine Arts in Boston, 1986-89. She has exhibited extensively in Texas and has received numerous residencies. Most recently, she completed an Art in Public Places commission for the city of Austin, a large-scale five-panel relief sculpture for the Deep Eddy EMS station. Her work is in collections nationwide, including that of the Women’s International News Gathering Service. Her work is available through Finesilver Gallery, Houston and San Antonio, Texas (www.finesilver.com). Photographer Ian Lemmonds lives and works in Memphis, Tenn. Photographic exhibitions include 2004’s “Halo Maintenance” and “Things I found at Thrift Stores.” Installation exhibitions include 2006’s “Sometimes the Medicine Kills You,” and “Some Things Never Get Better.” Born in Arkansas and raised in Omaha, Nebraska, Lemmonds’ family moved back to Arkansas when he was twelve. He attended college in Louisiana, moved to Seattle, Wa., and then moved to Memphis, where he began to take pictures. His photographs feature various found and purchased objects, often in a domestic context. He arranges objects to evoke a sense of wonder, a wonder that he feels everyone experiences, sometimes in the simplest activities. “I buy things from second-hand stores all over the South, take them home, and meddle with their context to make them evoke something. Context is everything…how objects relate to their environments.” Lemmonds’ work is available through L. Ross Gallery, Memphis, Tenn. (www.lrossgallery.com). Paul Villinski was born in York, Maine, and has lived and worked in New York City since 1982. He attended Phillips Exeter Academy, the Massachusetts College of Art, and earned his BFA with honors from Cooper Union. His work has been included in more than 70 exhibitions, including recent shows at the Islip Art Museum, the Ogunquit Museum of American Art, Carnegie Mellon University, the University of Wyoming Art Museum, and Morgan Lehman Gallery. He has been a recipient of a National Endowment for the Arts grant. His work is included in many private and corporate collections, including the collection of Tina Weymouth and Chris Franz, now of Westport, Conn., formerly of “Talking Heads.” As a pilot of sailplanes and paragliders, metaphors of flight provide a central theme for his art. For his beer-can butterflies, he asks, “Who are the sidewalk drinkers who leave behind these thousands of crushed beer cans, forlorn evidence scattered along the streets of the city? With tin snips, files, and a jeweler’s grinder, I take these “dead soldiers”—every one of them once raised to someone’s lips—and try to breathe life into them, my process in the studio mimicking the act of transformation and rebirth that butterflies symbolize everywhere.” Villinski’s butterflies are “intended as quiet images of hope, community, recovery, and the possibility of change, of acts of kindness.” He asks, perhaps rhetorically, “If a handful of littered beer cans can metamorphose into a flock of fluttering butterflies, what else might be?” Villinski’s work is available through Morgan Lehman Gallery, New York City and Lakeville, Conn. (www.morganlehmangallery.com). "New and Used” runs at the Bradbury Gallery through April 15. Gallery hours are 12 p.m.- 5 p.m., Tuesday-Saturday and 2 p.m.- 5 p.m. on Sunday. The exhibition and the reception are free and open to the public. For additional information, please contact the Bradbury Gallery at (870) 972-2567.